Summer is already here and, especially for teachers, well earned holidays are just around the corner. However, if you do feel like you struggle when it comes to your own relationship with music or teaching music in the classroom, here’s 5 ways you can build your confidence with it this summer. Learning music really doesn’t change depending on the age you are and the three strand approach of: listening, performance and composition (in that order) is what you should think about for developing your own musicality. A lot of these music festivals can be an expensive commitment, so as an alternative you can check out your local county council’s website to see what free events are being run over the summer. Spotify discover playlist - Spotify creates a curated weekly mix based on the styles of music you're listen to. My playlist is usually 30 tracks long all from artists I’ve usually never heard of. It’s the perfect accompaniment for a long drive down the country. Listening while showering/cooking/gardening etc. - to get more comfortable with music it’s often about the simple ways you can incorporate it in to your day. Get the speakers on during the barbeque or while you’re clearing out the attic. Driving - forget about the talking heads radio shows this summer and listen to some Talking Heads - they’re great! Go to gigs on holiday - one of my favourite things to do on holiday is to check out the music scene in a different country. Lots of destinations promote their local arts festivals and often have summer music programs aimed at tourists. When I was learning trombone as a kid, I had a music teacher who use to tell me that if I could sing it, I could play it. What he meant was that if I could get a particular melody into my head from singing through it, playing it on trombone would be a lot easier. Association of Irish Choirs - they have a listing section on the site where choirs throughout the country will put up opportunities to join them. Gospel Rising - this festival for Gospel music has produced a directory of Irish gospel choirs. Choir Place - useful directory of many of the community choirs in Ireland. Association of Irish Musical Societies - find a musical society near you. Walton’s Music School - they have adult beginner evening courses for guitar, piano, singing etc. School of Irish Traditional Music, Donegal - they have beginner courses for adults wanting to learn Irish traditional music. Ukulele clubs - one of the great things about the ukulele is that it’s cheap to buy and easy to play. 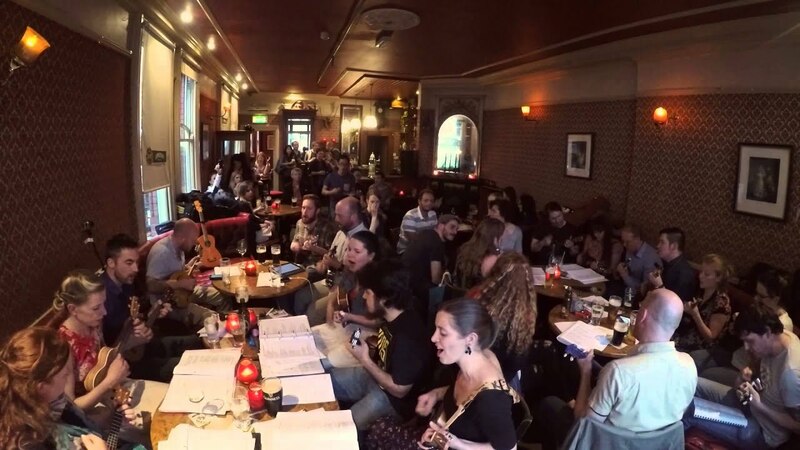 Here are some links for Irish ukulele clubs. Comhaltas - Comhaltas are a group responsible for promoting and preserving Irish music. They have some summer courses they’re involved in as well as lots of ongoing programs for beginner trad players. Something myself and a number of my friends do is try and compose pieces of music. When you get in to it, I personally find it can be one of the most creatively satisfying activities in music. It can help if you play a bit of guitar or piano to figure out chords to add, but it’s not essential. You can simply sing, clap and stomp your feet. The reason I think writing lyrics helps with writing music is because quite often words have a natural rhythm which can help shape the overall composition. Once I have written lyrics, often the melody for the lyrics will become apparent. The lyrics can help dictate what the mood of the piece should be; whether it should be sad or happy, fast or slow. Sometimes what can help is to simply start singing a melody to the words and you’ll figure out what you like and what you don’t and it will refine from there. You can stop at step 2 if you like, but if you have the inclination and access to an accompanying instrument like a piano, guitar or ukulele, you can try adding some chords to your composition. Three chords which are very simple as a structure is the I, IV, V of a key. If, for example, you’re in C major this means the three chords would be C (I), F (IV) and G (V). Here’s a great video showing all the famous songs that use the same 4 chord structure. If you do write a song, you might not win any Grammies, but who cares?! Write a song for a friend’s birthday. Write a song for your partner. It really doesn’t matter what or how good it is; the process of doing it is more important than the actual output. Along with the music curriculum, the Department of Education produced a ‘Music Teacher Guidelines’. While it’s a substantial read, it’s also a very worthwhile read. The guide is excellently put together and goes into in-depth advice on everything from how to structure lesson plans to what instruments you should use in the classroom. We are running 3 week-long summer courses across Ireland for teachers to introduce them to our new method of teaching music in the classroom, specifically designed for Irish primary schools. We cover all aspects of the music curriculum and no musical experience is required to take part. Whatever you do this summer, get out and enjoy the music around you. Ireland is full of fantastic musical talent waiting for you to go and discover it! If you've got any other tips for musical activities this summer, leave it in the comments below.